Calling all Entertainers and Speakers! 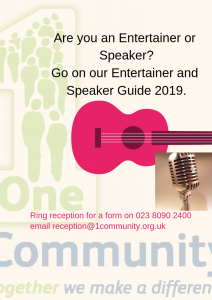 At One Community we have an excellent resource in the form of the Entertainers and Speakers Guide. Every quarter we update the content and we have picked up that there are a few changes to be made in the details of our guide. Some have opted to come off the guide altogether. What we would like is some new talented entertainers and speakers to get into our guide. We would really like lots of people from the Eastleigh and Fareham areas to go in it. Here is a flyer all about it. There is a short form to complete. If you ring reception on 023 8090 2400 or email reception@1community.org.uk we will get the form out to you to complete your details. You do not have to pay anything to go into the guide. You can download it or we can email it to you. *If you would like a hard copy of the Guide, there is a small charge for photocopying and postage.